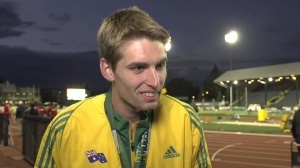 Cedric Dubler scored 8114 points at Australian Championships at Sydney and become Australia's first Olympic decathlete for sixteen years (since Scott Ferrier in Sydney Olympics 2000). His final score of 8114 was a personal best by more than 300 points. Great to see the Land of Oz produce a world class decathlete. Let's hope this is the start of a trend.